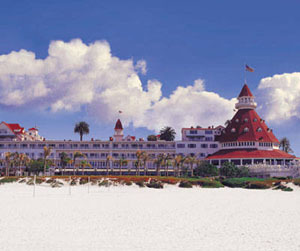 You can also stay in the hotel room where singer Janis Joplin died in 1970 from a heroin overdose. Room 105 of the former Landmark Motor Hotel in Los Angeles, now the Highland Gardens Hotel, in which Joplin spent her final hours, is still a rentable room. The closet contains a small brass plaque commemorating Joplin's life, and the walls are heavily decorated with fan art and notes. Queen Mary Steamship, Long Beach: The majestic Queen Mary steamship, moored at Long Beach, offers you the chance to step back in time aboard one of the most famous ocean liners in history. 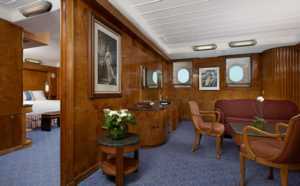 From the time her construction began in 1930 in Clydebank, Scotland, she was destined to stand in a class all her own. From celebrities like Fred Astaire to dignitaries such as the Duke and Duchess of Windsor, she carried some of the world's most renowned personalities and political leaders. 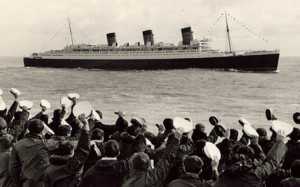 In 1939, at the start of the World War II, the Queen Mary was drafted into service and outfitted as a troopship, deemed the Grey Ghost due to her new camouflaged grey exterior. When the war ended, she was restored to her former glory and continued passenger service. In 1966 Cunard sold the Queen Mary and thus began the ship's transition and journey to her new home in Long Beach, California. Hauntings and ghost stories abound onboard this beauty! Holbrooke Hotel, Grass Valley: This hotel is one of the premiere landmarks in the Gold Country of the Sierra Nevada, dating back to the 1860s. Come stay in rooms where Presidents Ulysses S. Grant, Grover Cleveland and Benjamin Harrison once slept. The Holbrooke blends historic Grass Valley Gold Rush era ambiance with modern conveniences and is well within walking distance of shops, galleries, museums and restaurants. Gold Rush history buffs can tour the Empire and Malakoff-Diggins mines, now California state parks. 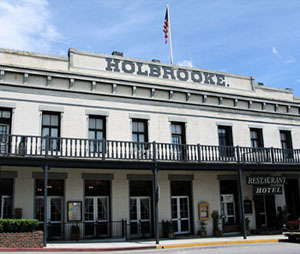 Many rooms in the historic Holbrooke Hotel have their eerie histories, characters and tales. Sleep in the Black Bart Room, used by the highwayman who robbed the stagecoaches of the rich. Catch some Zs in Room 9, and wake up to a Victorian-dressed maid folding your clothes. But beware of a room where a suicidal gambler slit his throat and was found dead no one knows which room it happened in!